Lanterns On The Lake is a five-piece indie rock band from Newcastle-upon-tyne, United Kingdom. 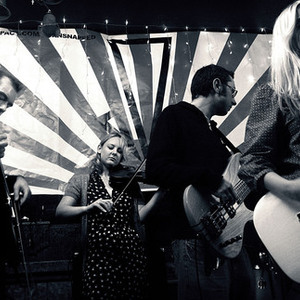 Formed in 2007, the band is composed of Hazel Wilde, Paul Gregory, Sarah Kemp, Oliver Ketteringham and Andrew Scrogham. The band has released two EPs, 'The Starlight EP' (2009) and 'Misfortunes & Minor Victories' (2010). Budgets being tiny for the EPs, the band borrowed an eight-track recorder and captured every intimate breath and soaring crescendo in their own homes and at an isolated house in Northumberland. Handmade sleeves for both EPs reinforced the self-sufficient approach. The band has released two EPs, 'The Starlight EP' (2009) and 'Misfortunes & Minor Victories' (2010). Budgets being tiny for the EPs, the band borrowed an eight-track recorder and captured every intimate breath and soaring crescendo in their own homes and at an isolated house in Northumberland. Handmade sleeves for both EPs reinforced the self-sufficient approach. Their d?but album 'Gracious Tide, Take Me Home' was released on 19 September 2011 through Bella Union . The album was produced by Paul Gregory, as he did the band's first two EPs. Relishing their independence, the band eschewed a recording studio for the album, though the loud bits were done in a basement of a shop in Newcastle.